“I don’t think there’s a firefighter out there who looks forward to a snowstorm if they’re on duty,’’ said state Fire Marshal Stephen D. Coan. On Sunday, firefighters responding to a house fire on Barnum Street in Taunton found that all three nearby hydrants were frozen and had to rely on the water carried in their trucks to douse the flames. But the fire trapped five people on the second floor. Firefighters had to trudge through the snowbanks and balance ladders on the ground to save the residents, work made more difficult when water from the hoses freezes on the ladder’s rungs. Frozen hydrants are typically caused by leaks in the valves that connect the hydrants with the water mains below. Hydrants are supposed to be empty until firefighters open the underground valves, but when those valves leak, water floods the hydrants. Once that water turns to ice, the hydrants are useless. Of course, even properly working fire hydrants are not much help when they are buried under packed snow. Nearly every fire department sends its units out into the community after a storm to dig out the hydrants, but even with an entire department hitting the streets, it can take a week to clear a moderately sized town. It is illegal in Massachusetts to pile, push, or plow snow on top of a hydrant, but there is no state law requiring people, even fire departments, to shovel out hydrants after a storm, Coan said. Some communities have ordinances or bylaws, and many cities and towns simply ask residents to pitch in when they can. Before most storms, Coan sends out an alert, asking residents to “adopt’’ a local hydrant by digging it out after the snow. During the Dec. 26 blizzard, firefighters were slowed in battling a building fire in Belmont because hydrants were buried. No one was hurt, but the scare prompted the town to ask residents to step in. Belmont has no residential property shoveling law or anything addressing fire hydrants in the snow. “It’s not a rule, but it’s a good citizenship thing to do,’’ said town administrator Thomas G. Younger. Working in extreme cold also takes a tremendous physical toll on firefighters. In a fire, overspray from hoses coats everything in an icy glaze. It’s common and eerie to see a firefighter coming out of a burning building, emerging from the flames with icicles hanging off his coat and helmet. That sudden move from extreme cold to extreme heat and back again is dangerous; it impairs your memory and strains your heart, according to health specialists. Firefighters do prepare for winter conditions. At the Massachusetts Fire Academy in Stow Tuesday, cadets went through a normal day’s drills, climbed ladders, and battled training fires as the snow fell on them. On Tuesday, a house fire in Grafton required response from several neighboring communities as firefighters trudged through the storm and thigh-high snowbanks to fight a natural gas-fueled fire. The fire was large, but the four alarms were called mostly to bring in fresh manpower, fire officials said. 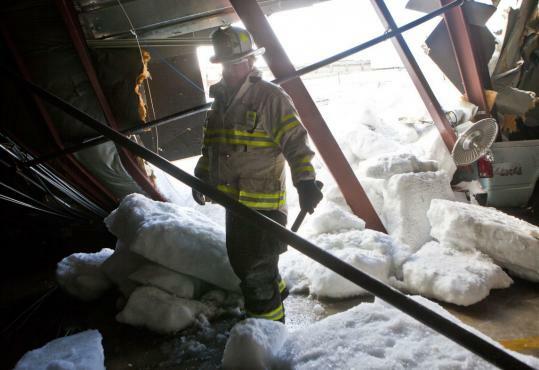 “The snow really takes its toll on firefighters,’’ said Grafton Fire Chief Michael Gauthier. As the forecast called for a pair of winter storms to strike Massachusetts this week, local fire chiefs had to brace themselves. The foul weather creates obvious driving challenges, and it leads to numerous accidents. On Monday, Norwell and Marshfield firefighters responded to a rollover in the median on Route 3 north. Firefighters struggled in the slippery conditions to get the driver up the embankment, Reardon said. One firefighter fell and had to be treated for minor injuries. Reardon, whose department handles fires and runs paramedic service for Norwell, said one of the pitfalls his rescuers face is trying to get a stretcher into a house, and then getting that stretcher — with a patient on it — back out to the ambulance without anyone getting hurt. “Most folks have their walkways clear enough so that the door opens and they can let the dog or cat out, but they never really think about having three to four people get in there and pull them out on a stretcher,’’ Reardon said. Firefighters say the cold weather dangers are all part of the job, but there are things people can do to help. “If everybody could just look outside and make sure that the local hydrant is clear and the walkway to their house is clear enough so people can easily walk up and down it, it would make life a lot easier,’’ Reardon said.